Pens & Needles Lakeside is a well-kept secret that is hiding in plain sight. We can be found on US Highway 59, just 6.5 short miles south of US Highway 10 in Detroit Lakes. The interactive Google map below will assist you in finding us no matter where you are starting from. Our Craft Weekend Package starts on Thursday at 6:00 PM. The Weekend Package includes Thursday, Friday and Saturday nights and ends on Sunday at 1:00 PM. Wednesday or Sunday nights can be added to any package, if available, for $35.00/person per night with a minimum of 4 persons staying the night. 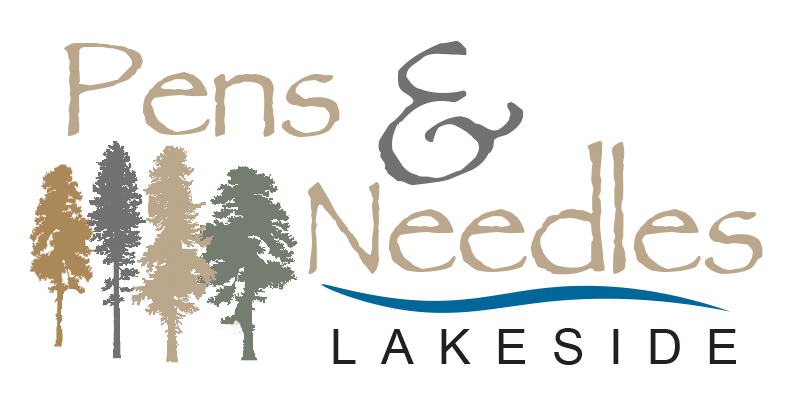 Pens & Needles Lakeside currently has openings for the days shown on our calendar. To make a reservation or for additional information please select the "Contact Us" link and fill out the requested information. If you are a party of one or two persons hoping to join a larger group, contact us and we will try to find you a group to join. It's a great way to make new friends! For smaller groups up to 6 guests. The No Frills weekend is designed for small groups that have all of the tools needed to work on their craft. Set in the smaller Brookside unit, spacious individual workstations and comfortable chairs are provided along with a kitchen equipped to prepare your meals, two bedrooms, loft and a handicapable bathroom with walk-in shower. For medium groups of 7-12 guests. The Deluxe Weekend is set in the larger Lakeside unit and will accommodate up to 12 guests. 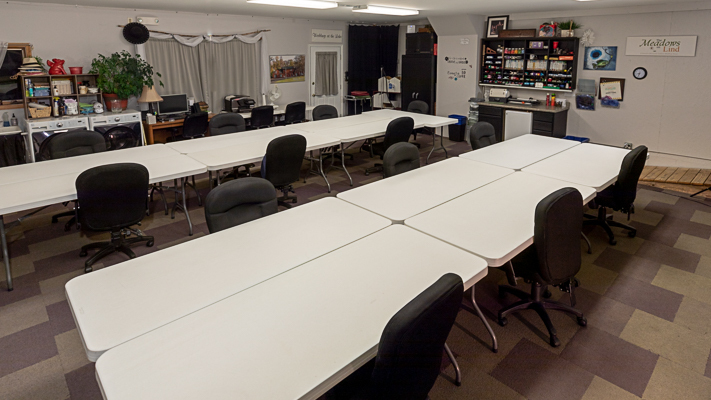 The Deluxe package includes the full use of the studio with its large individual work stations, ergonomic chairs, computer work station, photo printer, and many various scrapbooking tools. The comfortably furnished lounge is equipped with a fireplace, large-screen TV, DVD player and more. For large groups of 13-20 guests. The Grand Weekend is for larger groups and utilizes both the Lakeside and Brookside units. The Grand weekend will accommodate 18 to 20 guests and includes all of the amenities listed in both the No-Frills and Deluxe Weekend packages. * Taxes not included, prices are subject to change. Weekends start Thursday at 6:00 PM and end Sunday 1:00 PM Each group provides their own food during their stay or catering is available. Our kitchen is equipped with all the tools needed to prepare your meals. Washcloths, hand towels, and bedding are provided for our overnight guests. Charge cards are accepted. A 3% service fee is charged. For information and rates on other activities, please fill our form below. No stairs to climb or hallways to traverse to get into the studio. The entry in on ground level and the parking is right out the front door. High-speed wireless internet is available throughout the entire property. I see that your prices for the Deluxe package are based on based on 12-person occupancy. Do I need to have 12 people? No, You may have any number up to 12. The price is the same as you are renting the entire space. If you have less than six, you may want to consider the No-Frills package. This utilizes the Brookside unit that will accommodate up to six. Do we need to bring towels, sheets, etc.? Yes, please bring your own bath towels, personal hygiene items, clothing, and your scrapbooking supplies. We supply the bed linens and hand towels for your use. Smoking, including the use of e-cigarettes is not allowed inside any building on the property and only allowed in designated outdoor areas. Smokeless tobacco use is not permitted. Yes, we have a desktop computer running Windows 10 and 100meg wireless internet. What do you provide for workspace? Each person has a minimum of a six-foot table with an ergonomic, adjustable chair. Depending on the size of your group, additional space may be available. Do you have any special tools or software? Our Deluxe and Grand packages include the use of the studio where we have a Cricut cutting machine with many cartridges, a Creative Memories Cutting System, paper cutters, and over 80 punches. What tools are available for quilters? Quilters need to provide their own tools and equipment. Please contact us for additional information. Yes, central heating & air-conditioning supplies the living quarters while the studio has in-floor heat and a wall air conditioner. Each group is responsible for their own meals. Each of our units has a full kitchen that has the utensils to prepare and serve your meals. Many groups divide up meal responsibilities, some have meals catered in and some enjoy dining out at one of our local, unique restaurants. Housekeeping is not provided. Each group is responsible for making your own beds, picking up after yourselves, and removing trash to the exterior trash bins. Absolutely! We recycle metals, glass, plastics, paper, and cardboard. Receptacles for each is provided in various locations. Food contaminated cardboard and paper is not recyclable. We have a number of excellent and unique restaurants in addition to some familiar family chains and fast food restaurants. Below is a list of some of our local and unique favorites. All are located in Detroit Lake Chamber of Commerce (https://www.visitdetroitlakes.com/dine-wine-brew/overview) unless noted.